Beautiful certificate from the Continental Trust Company issued in 1908. This historic document was printed by American Bank Note Company and has an ornate border around it with a vignette of a minuteman soldier. This item has the signatures of the Company's President and Secretary and is over 98 years old. 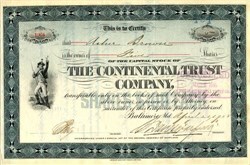 The Continental Trust Company was incorporated in Maryland, with headquarters in Baltimore. On February 7, 1904, Baltimore was for the most part destroyed by a massive fire that took over 30 hours to extinguish. At the time, the Continental Trust Building at the corner of Calvert and Baltimore Avenues was the city�s tallest. It was gutted by the fire, but the structure managed to survive. The blaze started in the basement of the Hurst Building, at the corner of Liberty and German Streets. The corner of Calvert and Baltimore Streets would become the hottest spot of the Great Baltimore Fire. By 10 p.m. Sunday night, three skyscrapers were ablaze: Maryland Trust Company (left), B" O Railroad Building (center background), and Continental Trust Company (right). Temperatures here reached 2,500 degrees and the glare could be seen from the Eastern Shore and Washington. At 16 stories, the Continental Trust was Baltimore's tallest structure. It would survive the fire. Solomon Davies Warfield was born in Maryland in 1859. During the 1880's, he established the Warfield Manufacturing Company in Baltimore to manufacture corn cutters and silkers invented by him. He was Postmaster of Baltimore from 1894 to 1905. In 1898 he became associated with John Skelton Williams and assisted in the formation ofthe Seaboard Air Line Railway Company in 1900.He was Chairman of Receivers for this company in 1908-09. Following the receivership, he was Chairman of the Executive Committee and finally President of the SAL and its affiliated Baltimore Steam Packet Company from 1918 until his death in 1927. A veritable wilderness until 1924, Indiantown is located between Lake Okeechobee and the Atlantic Coast on the only cross-state canal, which was constructed by the U.S. Army Corps of Engineers around WWI. S. Davies Warfield, a Baltimore financier, attempted to build up the Indiantown area with a second railroad, today�s CSX Transportation System - resurrection of the Seminole Inn and plans for a resort community. He even had dreams of making Indiantown the county seat. Davies died in 1927, and with him went the many dreams he had for the community. S. Davies Warfield was president of Old Bay Line, Chesapeake Bay, and uncle of the Duchess of Windsor, wife of the former Edward VIII, King of England in 1936. The S.S. President Warfield was named after Solomon Davies Warfield. Manned by a British merchant crew led by Capt. J. R. Williams, she departed St. John�s, Newfoundland, 21 September 1942, with other small passenger steamers bound for the United Kingdom. Attacked by a German submarine 800 miles west of Ireland on the 25th, she evaded one torpedo, and, after the scattering of her convoy, reached Belfast, Ireland. In Britain, she served as a barracks and training ship on the Torrige River at Instow. 206 MARYLAND MANUAL. The Adjutant-General: HENRY M. WARFIELD (Democrat), Baltimore County, Md. General Warfield was born in Baltimore, July 1, 1867. He is a son of the late Henry M. Warfield, who was the candi- date for Mayor of Baltimore on the reform ticket in 1875. His brothers are B. Emory Warfield, president of the Hanover Fire Insurance Company of New York, and S. Davies Warfield, president of the Continental Trust Company of Baltimore. The latter was a candidate for Mayor of Baltimore in 1891 and Postmaster of Baltimore for eleven years, having been appointed by President Cleveland and reappointed by President McKinley. 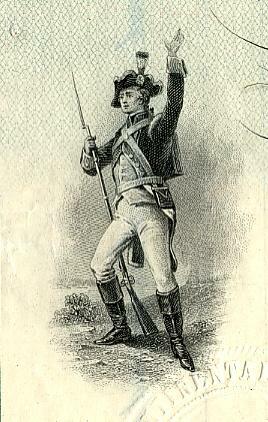 General Warfield enlisted as a private in Company K, Fifth. Regiment Infantry, Maryland National Guard, Novem- ber 1, 1885, and served continuously until January 22, 1908, on which date he was appointed The Adjutant-General of Maryland by Governor Crothers. He was elected Second Lieutenant of Company K, November 1, 1888, afterwards becoming First Lieutenant of Com- pany F, Captain on Regimental Staff, Captain of Company B, Major and Colonel, being elected to the latter position on June 30, 1903. General Warfield has always taken much interest in the affairs of his native city, both business and social. He is the resident manager of the Royal Insurance Company, Ltd., of Liverpool, with offices in the Chamber of Commerce Build- ing, Baltimore, and one of the directors of the Board of Trade. His membership in the clubs of Baltimore includes the Maryland, Elkridge, Merchants' and Bachelors' Cotillon.